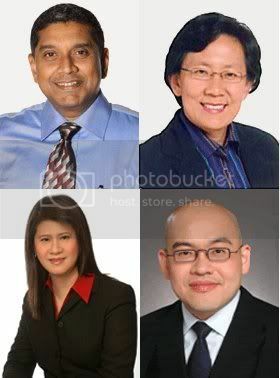 A Nominated Member of Parliament (NMP) is technically an unelected member of the Parliament who does not represent any political party or electoral district in the Singapore Parliament. The scheme was first introduced in the 1990s in order to bring more independent voices into parliament. There are currently nine NMPs in parliament. What happens is that the Special Select Committee of the Parliament sends out invites to the general public and functional groups to submit names of anyone to take on the role of NMPs. The Parliamentary Select Committee comprises 10 members, one of which is from the opposition, and is responsible for the assessment of all the eligible candidates. The nine selected candidates are nominated by the committee to be appointed by the President. Currently, NMPs are allowed to vote on all issues except public funds, amendment of constitution, vote of no confidence in the government and removal of President from office. The reasons given for the NMP scheme were varied. According to Mr Wong Kan Seng, the scheme was introduced due to the disappointing performances of the four opposition MPs in parliament. Opposition veteran Mr Chiam See Tong was against the NMP scheme, citing the fact that the NMP scheme represented nobody and ran counter to the democratic principles of representation and accountability. Chiam’s criticism was noteworthy as it highlighted the flaws of the NMP scheme firstly, and secondly, it lays the basis of reforms as suggested in this article. Chiam rightly pointed out that the NMP scheme resulted in the appointment of individuals to parliament who didn’t represent any one. It is also not democratic due to the fact that it is a select committee that has a big say over which candidate gets the final nod into parliament. Simply put, the committee doesn’t necessarily represent the people’s views, much less that of a minority or fringe group. The basis of the suggested reform lies not only in the flaws in our current NMP scheme, but also our current pluralistic voting system which is also known as First Past the Post based on the “majority wins” principle. The candidate with the most number of votes will be the winner who takes all. One obvious criticism against such an electoral system is that the “tyranny of majority” scenario can be easily manifested and at the expense of the minorities. If, for instance, a particular candidate argues for certain policies that majority are in favor with, and subsequently wins the elections, the latter is likely to push for the policies in parliament. The question is how can the interests of minority and fringe groups that are adversely affected by such policies be served? With all the criticisms and highlighted flaws, we now have a basis to brainstorm on a possible reform. Recall that the appointment of NMPs begins with invitations being sent out by the Special Select Committee to the general public and functional groups. We can retain this portion in the reform because this in essence is a net cast out to identify potential candidates. However, the reforms come in where the fringe groups or other minority groups have to go through mandatory elections to elect a representative that will provide their voices in parliament. Thus, this net is specially cast to catch fringe or minority voices that will represent such interests in parliament. However, these groups have to undergo a formal election. How the government can assist is through the provision of a set of guidelines on the conduct of a proper election, and have a witness from the judiciary for instance, to ensure that the election of the minority or fringe group representative is conducted in a proper manner. The current number of NMPs is capped at nine, but it is too small a number to capture wide representation of fringe and minority groups out there. Hence, there shouldn’t be a limitation or cap on the number of NMPs. At this stage, the Parliamentary Select Committee nomination and presidential appointment should be done away with in this suggested reform. If a fringe or minority group feels it should have a right to have a voice in parliament, there shouldn’t be any committee to stop its progress into parliament. Hence, this reform strives towards the principle of proportional representation, although it is still not there yet. But, at least, the minority and fringe groups get their representatives in parliament. 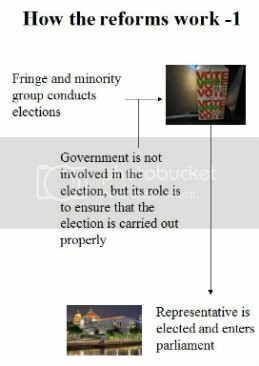 Also, it addresses previous criticisms in the sense that the representative is elected through proper elections, is representing a minority and fringe group and enters parliament on the basis of an election and not through the selection of a committee. The next question is – what voting powers does such a representative possess? Ideally, the representative shouldn’t possess the same voting powers under the current NMP scheme (can vote on all issues except four). This is because if there are a hundred fringe or minority group representatives and they happen to harbor the same stand on a certain issue, they can end up being the majority votes versus our 84 MPs in parliament. Then, it will be a case of “tyranny of the minority”. However, what can be done is that these representatives can be bestowed the power to exercise a special vote known as the “vote of exclusion”. What does it mean? 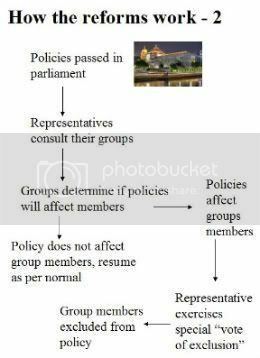 If majority of the 84 MPs vote in favor of a policy that the representative finds is not conducive and adversely affects the group he represents upon subsequent consultation with his members, he has the power to request that the group be excluded from the policy. Here is a fictitious scenario. Say for instance, 82 MPs in parliament vote overwhelmingly in favor of having streaming examination in children aged 11 years of age. A representative from a parental group supporting intellectually-disabled children would consult with her own group, who decides not to support the streaming policy. Hence, she will request for this “special vote of exclusion” to request the intellectually disabled children to be excluded from the streaming policy. Thus, representatives have no power to vote on issues, but they should have the power to request exclusion for the groups they represent from policies that will affect them. Hence, the “special vote of exclusion”. Our current NMP system attempts to cast a wide net into public initially, and this is the part we should retain. However, the reforms come in when the functional and minority groups carry out elections to identify their representatives with the selection committee being done away with. Also, the other reform is that the representative has no powers of vote on the same issues as stated in the current allowance under the NMP scheme, but can exercise a “special vote of exclusion” to request exclusion of the group they represent from the policies if found to affect their fellow members’ interests. With these suggested reforms, it will be a misnomer to call these representatives NMPs. A more apt term will be “Elected Representatives” (ER). The good thing about this suggested reform is that the interests of otherwise under-represented groups will be highlighted in parliament. In a way, no one really gets left behind, including those among the minority and fringes.